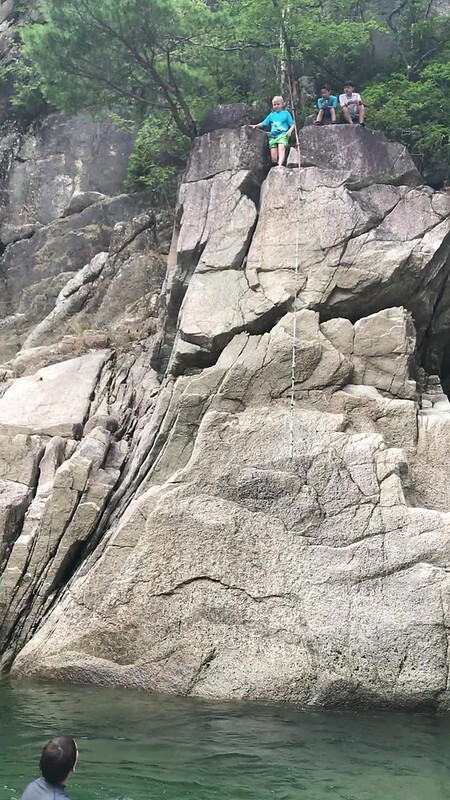 Last weekend we got away from the city and work and headed up to the Kanzaki River in the mountains of Shiga Prefecture for some “shower climbing”. Shower climbing is what the Japanese call canyoning or river hiking. The Kanzaki River starts in the mountains between Lake Biwa and Nagoya Bay. We set up camp on a quiet part of the river and spent two days relaxing and enjoy nature. August weather in Japan is oppressively hot and humid, so it was such a relief to swim in the cool, clear waters of the river. The water was not as high as in previous times we’ve gone up there, but we enjoyed it just the same. The kids are so much more confident in the water now than they were two years ago. 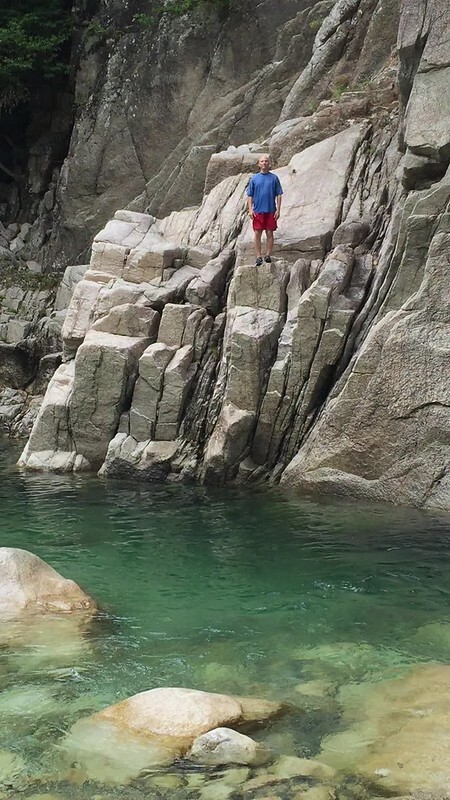 Our two hikes consisted of scrambling over rocks and stopping at water holes to jump from the cliffs and swim. As you can see below, I am not quite as brave as the boys regarding jumping heights. I really enjoyed the camping. Nadia had an air mattress for us in the tent and it was a perfect sleeping temperature. We ate well, with Naoki on the super deluxe Coleman camping stove! Between the views of the white rocks, green trees and blue skies and the refreshing water, it really recharged my spirit. It also reminded me of the importance of wilderness and I plan to take the family out more often this year. It was also nice to pleasant to connect with friends sitting around the campfire.